How does the pretrial release process work? When someone is arrested (in states that operate with commercial bail), a determination is made as to the type of pretrial release that will be considered based on the severity of the charge. For low level offenses, defendants are often cited and released or released on their own recognizance. For more serious charges, a bail amount is often set by an officer of the court using a bail schedule (a predetermined range of bail amounts by charge category) maintained by that jurisdiction. Once a bail amount has been set, the defendant can now exercise his right to post bail. Initial bond settings are often reviewed within a few days if the defendant has not posted bail. Typically, the defendant enlists the help of family and friends to work with a 3rd party commercial bail agent to post their bond for a small fee (premium). This additional layer of accountability ensures that the defendant will appear at all court proceedings and adhere to any other conditions set by the court. Once the defendant appears at all court proceedings and the case has been adjudicated, the bond is then discharged by the court releasing the financial responsibility of the bail agency based on the completion of the case. 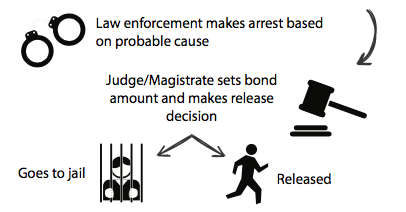 What are the different types of pretrial release mechanisms available to the defendant? Own Recognizance Release (OR) – if a defendant is not deemed a risk to the community or a flight risk, a judge may release that person on their own recognizance. This type of release typically occurs with low level non-violent, first time offenders. It means that they do not have to put up any money, but must simply promise to appear for all court appearances. Pretrial Services Release – if a defendant is not deemed a serious risk to the community or a flight risk, but there may be other circumstances (substance abuse, mental health, etc. ), a judge may release that person to a pretrial service agency. This taxpayer funded agency is then responsible for ensuring that the defendant shows up for all court appearances. Additionally, these agencies may also be responsible for ensuring that the defendant attend substance abuse classes or seek mental health assistance, etc. In recent years, the expansion of state funded pretrial services often include onerous and restrictive “conditions” set by the court mirroring that of probationary conditions – all before any conviction at all. Full Cash Release – if a defendant is deemed a risk to the community or a flight risk, and a judge/magistrate has set a bond using a bail schedule, the defendant can secure his release by paying the full amount of the bond to the court. This payment is a deposit to the court and will be refunded (less court costs and fees imposed by the judge) if the defendant appears for all court proceedings until final adjudication of the case, and once the bond has been exonerated by the court. Most jurisdictions require an official filing by the party who made the deposit for release of the funds. 10% Bond Release – if a defendant is deemed a risk to the community or a flight risk, and a judge/magistrate has set a bond using a bail schedule, the defendant can secure his release by paying 10% of the amount of the bond amount directly to the court. This payment is a deposit to the court and will be refunded (less court costs and fees imposed by the judge) if the defendant appears for all court proceedings until final adjudication of the case, and once the bond has been exonerated by the court. Should the defendant fail to appear for a required court appearance, the court will forfeit the balance of the amount of the bond, issue a warrant for the defendant’s arrest, and enter a default judgement against the defendant for the amount of the bond. Bail Bond Release – if a defendant is deemed a risk to the community or a flight risk, and a judge/magistrate has set a bond using a bail schedule, the defendant can secure his release by paying the full amount of the bond to the court. If the defendant does not have the full amount of the bond, they can use a third-party entity, in this case a state licensed and regulated bail bond agent, to post the bond for them. This is typically done for a small fee or premium determined by the state, usually 10% or less of the bond amount (i.e., $1,000 bond would cost a defendant $100). The premium paid to the bail bond agent is much like a premium fee paid on any insurance policy. It is non-refundable and fully earned upon payment. The bail agent, for the premium paid, plays an essential role to both the defendant and court by guaranteeing that the defendant shows up for court. If the defendant fails to appear, the bail agent is responsible for either retrieving the defendant and bringing them back to court or paying the full amount of the bond to the court.